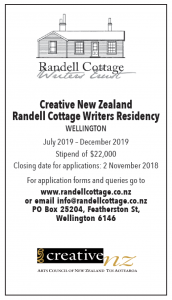 Possibly the prettiest writers residency in the country, Randell Cottage will be holding its annual Open Day on Sunday, 4 December, from 11:00am to 4:00pm. Trustees and members of the Friends of the Randell Cottage will be on hand to share its stories and those of the family who lived there. Built in 1867 and expanded in 1874, the Cottage is one of the ten oldest buildings in Wellington. It was gifted to the Randell Cottage Writers Trust by the Price family in 2001 after a painstaking restoration project, which saw the Prices haunting demolition yards and poring over Victorian wallpaper catalogues. Since then, it’s provided a haven for thirty writers from New Zealand and France – made possible by the support of Creative New Zealand, the New Zealand-France Friendship Fund, the Embassy of France and the Wellington City Council. The Cottage is currently home to Auckland novelist, playwright and poet Stephanie Johnson whose project is a non-fiction work, West Island: Five Twentieth Century New Zealanders in Australia. Other recent residents have included Witi Ihimaera, Owen Marshall, Tina Makeriti, Kirsty Gunn, Vivienne Plumb and Denis Welch. On the French side, it’s hosted novelists and poets including Nicolas Fargues, Than-Van Tran Nhut, Nicolas Kurtovich, Pierre Furlan, Annie Saumont and Nadine Ribault. Open Day 2016 coincides with the annual Thorndon Fair – together they combine the city’s history with its vibrant present. Note that parking may be limited.